Fish and shellfish are an important and healthy part of any pregnancy diet. They contain beneficial omega-3 fatty acids, are high in protein and low in saturated fat, all of which are crucial to a developing baby. However, in years past women have been warned to limit the types and quantity of fish they consume while pregnant due to high levels of mercury, which can cause damage to a fetus’ nervous system. Mercury occurs naturally in the environment, and also is released into the air due to industrial pollution, and can accumulate in streams and oceans, where it builds up in fish, especially those that eat other fish. So, many pregnant or nursing mothers are left wondering how to decipher between healthy fish and dangerous fish, and how much is safe to eat. The agencies found about 50% of pregnant women they surveyed ate fewer than 2 ounces a week, far less than the amount recommended. 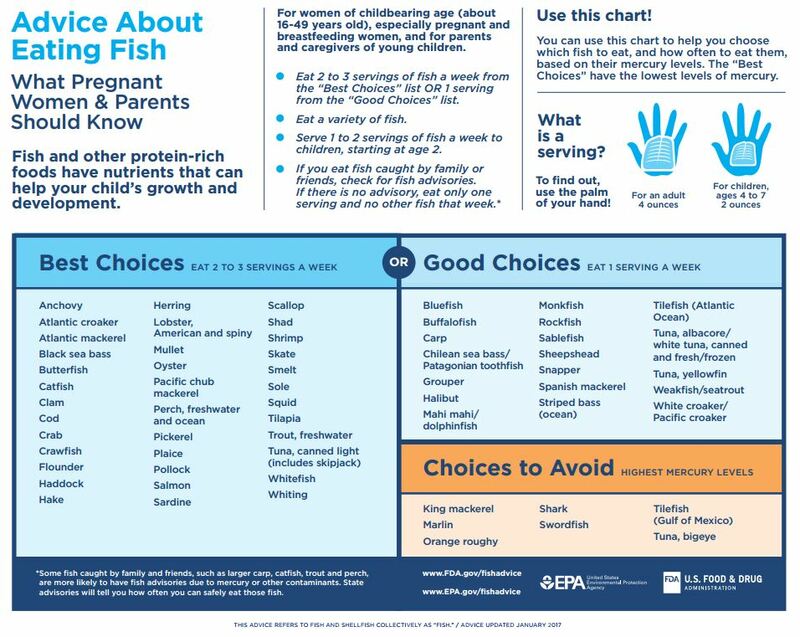 The FDA and EPA recommend women eat 2 to 3 servings, or 8 to 12 ounces (with a maximum of 12 ounces) of fish per week from the “best choices” category or 1 serving from the “good choices” list, as well as to eat a variety of fish. The good news is fish listed in the “Best Choice” category make up about 90% of fish eaten in the United States and contain the lowest levels of mercury. If fish is caught by family, friends or in a local lake, women should check for fish advisories. If there is no advisory, women should eat only one serving and no other fish that week. Due to high mercury levels, the agencies list fish to avoid, such as shark, swordfish and king mackerel.